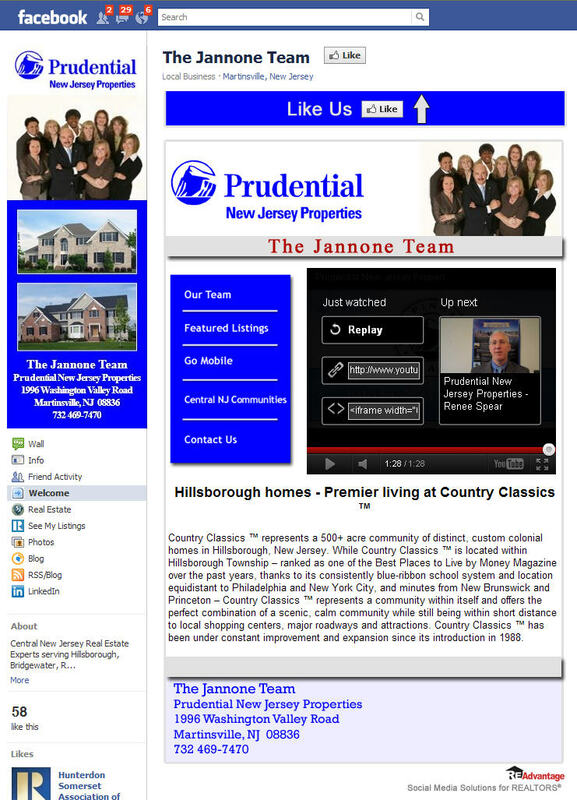 We are pleased to announce that The Jannone Team has launched a custom Facebook Fan Page designed by RE/Advantage. “Today’s Fan Pages need to be more than just a pretty picture”, say Bennie Henderson of RE/Advantage, “…they not only need to capture your audience but search engines too!” Many Facebook Pages are no more than a giant image that may look pleasing to the eye but what does that do for your ROI? You need lead generating and capture tools put in place for your prospects. RE/Advantage’s Facebook page, for example, uses Fan Gating. Our ‘non-liked’ page displays a welcome banner where you are asked to “Like Us” to receive some FREE Facebook tips. Once you click the like button you are redirected to another page describing our company with a link to click to receive the FREE Facebook tips. This link brings you to a simple form and upon completing the form you are brought back to the RE/Advantage main Facebook Fan Page. This options allows us to capture more interested fans because we entice them with some useful tips to “Like” us. REALTORS® can use that feature for market snapshots, buyers or sellers tips and checklists, etc. Fan Gating – Fan Gate is where non-fans who visit your page see one form of content and when they click the Like button to join your Page, the content changes to something just for your fans. Next postiPhone 4S fever – does it make sense to upgrade?